They’re setting up Canada Blooms today! We popped in this morning with 3,000 copies of our gorgeous Spring Gardens Special issue, which were requested to go into VIP goodie bags. While Mike was loading the boxes of magazines onto a skid, I strolled around and grabbed a few snaps while the garden installations were being finalized. 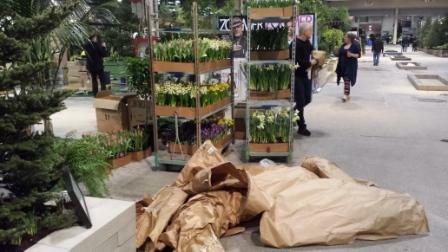 Racks and racks of potted blooming tulips, hyacinths and daffodils in all colours are being unwrapped and tucked into new rich earth. 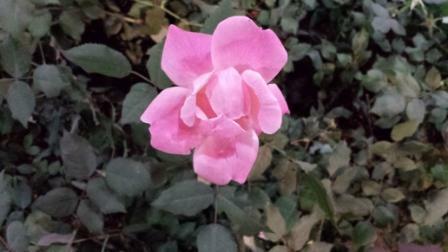 Beautiful pink rosebuds and blooms caught my eye. Breathe deeply. Can’t you just smell it? 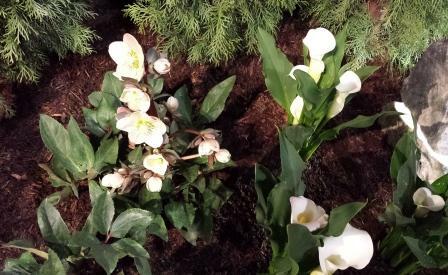 Pale hellebores bloom in patches alternating with calla lilies. The hellebores remind me that I should plant more of them in my own garden. They come in other colours, too. This year’s theme is Let’s Go To The Movies and an Oscar leans against a tree in this garden, waiting to be put in position. Palm trees suggesting Hollywood and Cannes are a strong feature at this year’s show. 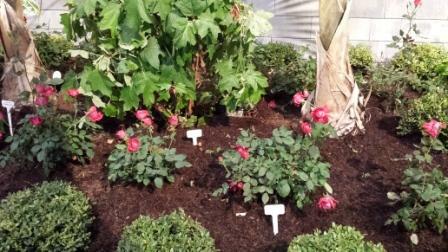 Here, red roses bloom at the feet of palm trees, bordered by boxwood balls. 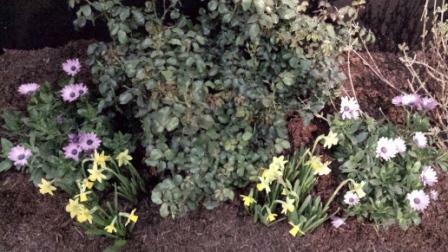 Mini daffodils gather at the base of what looks like a rosebush about to bloom, a daisy-looking flower at both ends. I don’t recognize it. Do you? 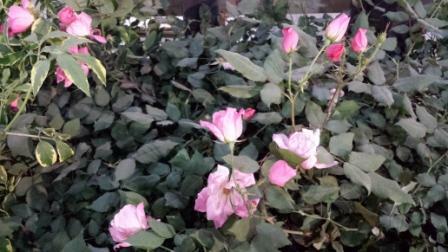 Canada Blooms opens tomorrow, March 9 and runs to March 18, at Enercare Centre, Exhibition Place, Toronto. We still may have a few free tickets available if you want them. Leave a comment here if you do. 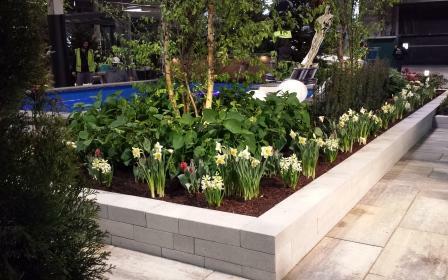 For more information, see www.CanadaBlooms.com. 2018 | Niagara Escarpment Views <Liked it!